Maybe you've given a thought to moving on from that high draft pick because of a slow start, but Scott White encourages you to fight your base instincts. For more Fantasy baseball insights, and to keep up with all the latest news, roster trends and more throughout the season, subscribe to Fantasy Baseball Today now on iTunes, Stitcher or Spotify. You can find us on YouTube now, with full episodes and clips available every Monday through Friday. The headline is a lie. Statistically speaking, it's unlikely every player drafted in the early rounds will be fine. It wasn't true for Joey Votto last year. Not Brian Dozier either. You may remember others. Kris Bryant, Carlos Correa and Gary Sanchez are among the early-rounders who fell well short of expectations. Josh Donaldson and Yu Darvish, too. But to me, there's a difference between a player who suffers an injury, sidelining him for an extended stretch or compromising his effectiveness, and one who disappoints purely on performance. The concerns for the former are obvious. The concerns for the latter are the ones being raised for so many of the mainstays across Fantasy Baseball right now. So think back with me to the early events of last year. How did Anthony Rizzo fare after his 1-for-74 (.149) start through 18 games? What about Matt Carpenter's 8-for-50 (.160) start through 15 games? There was also, lest we forget, George Springer's 9-for-52 (.173) start through 13 games, Alex Bregman's 14-for-66 (.212) through 17 games and Trevor Story's 11-for-62 (.177) start — with 26 strikeouts! — through 17 games. You want pitchers? Who could forget Zack Greinke's 4.80 ERA, Masahiro Tanaka's 6.04 ERA, Luis Castillo's 6.75 ERA, Rich Hill's 7.11 ERA or Marco Gonzales's 7.56 ERA — all after four starts? I'll tell you who could: all of us. We all did, because at season's end, they were blips too insignificant to remember. Of course, the examples change as you get deeper on the calendar, whether it's David Price's 5.11 ERA after seven starts or Carlos Carrasco's 4.50 ERA after 12. Probably the most memorable is Paul Goldschmidt, who was batting .209 with a .719 OPS at the end of May, 54 games into his season. He hit .330 with a 1.022 OPS the rest of the way. My favorite example, though, is James Paxton, whose ERA stood at 5.61 five starts into 2018. Two starts later, he'd strike out 16. The start after that, he'd throw a no-hitter. Or maybe this one hits closer to home: Jose Ramirez was 8 for 50 (.160) through 14 games last year. He'd hit .327 with a 1.103 OPS over the next 82. I bring up these examples because I feel like some of us at this still-too-early stage of the season are in need of a pep talk. I've seen reference to "rage dropping" on Twitter, most recently regarding Aaron Nola, as if any action taken with blinding and indiscriminate emotion would produce a desirable outcome. And I realize it's probably just venting, that the same sort of people still reading these kinds of articles in mid-April are invested enough to know better. But in a game like Fantasy Baseball, a little perspective goes a long way. If you haven't noticed, it's rife with contradictions, much like the sport it's modeled after. Pitching and hitting are more art than feat, and for both, trying harder often yields worse results. The same is true in Fantasy Baseball. So while you want to be aggressive on the waiver wire, rounding up all the potential breakouts at the point in the year when they're still available, you need to exhibit the utmost patience for your biggest investments, trusting the peaks and valleys to level out over the long haul. And while you should keep track of the day to day to stay ahead of your competition, you should go about it stoically, reacting to only the smallest percentage of what you see. If you can't separate the emotion of the day to day from the big picture, honestly, it's probably better if you back off for this first month. Sure, it's not ideal. Sure, you'll probably miss out on a big waiver wire find or two. But you risk doing more harm than good if you're unable to recognize not just what you might be getting with a transaction but what you might be giving up. The bottom line is that 2 1/2 weeks doesn't tell us anything of great significance. It'd probably go unnoticed, in fact, if it happened in late June. Even in cases where the peripherals back up the production, the peripherals themselves are subject to noise. What determines the difference between a droppable and undroppable player this time of year isn't performance but level of investment (which is often tied to track record) and likelihood of losing said player to someone else (which is often tied to level of investment). But maybe you know better not to drop an Aaron Nola, Jose Ramirez, Charlie Blackmon or whoever else might be grinding your gears this particular day. You should probably also know that now would be the worst time to trade them. Anyone making offers for these players has targeted them as buy-low opportunities, emphasis on the "low." It just doesn't pay to limit your team's upside in that way, especially when you have no reason to believe anything is actually wrong. And you don't. Sure, it's possible a slow start could be evidence of an injury, as it was for Corey Seager last year. He ended up needing Tommy John surgery before the end of April. But there needs to be evidence, or it's just wild speculation. You want to know why so many think pieces have already been written about Chris Sale this year? Because there's actual evidence, beyond just performance, that something may be wrong. He missed much of last season with a shoulder issue, was limited this spring and has come out averaging 6 mph less on his fastball than at his best last year. The concerns are justified. But even that's murky because of the unconventional way the Red Sox have handled him since the injury, with reports of them encouraging him to dial back the velocity. Does he dial it up in the weeks ahead? Yu Darvish, himself coming back from an elbow injury, peaked at only 95 mph in his first three starts but was hitting 98 with regularity toward the end of his most recent start Monday. The future suddenly looks brighter for a pitcher who mostly now just needs to get his stuff under control. 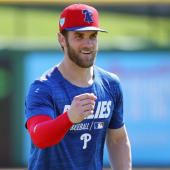 I could address some of the slow starters one by one, pointing out that it looks like Aaron Nola just didn't get enough work on his secondary stuff this spring, that Jose Ramirez is actually hitting breaking balls better so far and has his usual exit velocity on fastballs or that Jesus Aguilar is striking out less than ever after two productive seasons, but it should go without saying. Absent any real cause for concern, anyone you drafted thinking he was a slam-dunk starter deserves every chance to become that. Because the kind of upside those players are capable of delivering isn't easily replaced, at least not in leagues of a respectable size.